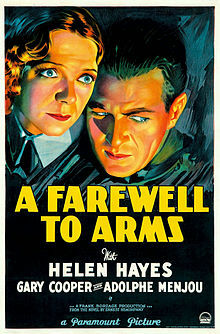 This entry was posted in Film, Film Review and tagged A Farewell to Arms, Adolphe Menjou, Blanche Friderici, Ernest Hemingway, Film, Frank Borzage, Gary Cooper, Gilbert Emery, Helen Hayes, Jack La Rue, Lisa Marie Bowman, Mary Forbes, Mary Philips, movie, review. Bookmark the permalink. Huh. I watched this on TCM The other day and I didn’t know that there was 2 versions. I guess TCM aired the European one. I really thought it was romantic. As for Hemingway, well he’s not a romantic man himself I don’t think.